While my potatoes have essentially died off, have been harvested or are waiting to be, the potato plants located in my vertical potato box are still going strong. The plants are beautiful and lush. The vertical potato box was an experiment this year. It stands about 3-31/2 feet tall and is made out of random wood pieces and pallet board I had around the house. I filled it with old barn hay, compost, dry grass clippings and straw. Which I learned over the summer will compact down to about 1/2 of where it originally sat. I never got around to continuously filling it so at this time, the box is about 1/2 full. 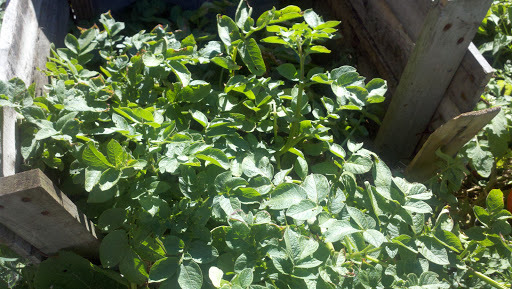 These potatos are showing no signs of "fall" that the rest of my garden is showing. I'm wondering if the plant will die off like the rest as it gets cooler or if frost will take them. I think I will wait it out to see. By the way, I broke down and removed a board on the side. Just to take a peek. Well nothing but fill was obvious from the side and I couldn't feel a close potato. Since my carpentry skills are awesome, the board refused to go back on. Oh well. Next year. Meems, all of my other potatoes died off weeks ago as well. I took this pic on Sunday and they are still going strong. If you do end up growing potatos in the tires, you could always spray paint the outside of the tires and plant flowers around them. I hope you blog about it if you do as I would like to compare notes. Wilson my neighbor is doing the vert potato growing experiment as well and is growing his in a barrel. I have yet to go over to see how his are doing but he mentioned that at least one plant made it. I am hoping to be there when he dumps it over. I hope there are lots of potatoes hiding for you in your potato box! thyme2garden we will soon find out. I'm not getting my hopes up just yet but it would be nice to have 5 lbs or so.